Where are the dogs' foot prints. Tim you bring up a valid point. Where are the footprints? Wow!. There's no footprints, your right, what the heck!. If you look to the right of the dog, there looks to be prints in the sand. Also the dog is by a beach. You know with water and waves that will cover or washway prints just like ours. There's no footprints because the dog is on concrete. The poster said he was scraping ice off car in the parking lot of apartment complex. 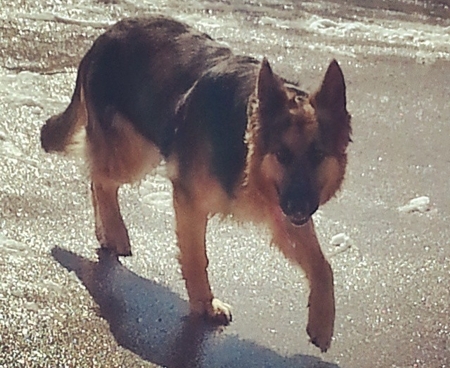 The dog is walking on ice covered concrete.